"If we don’t take climate action, the collapse of our civilisations and the extinction of much of the natural world is on the horizon." Changing Course is a flagship climate change initiative by Eco-Business and its partners that tells the global climate story through an Asian lens to inspire action. At its heart is the belief in the power of media to effect change and shift the course of history. The campaign was first launched in February 2018 at the start of the ClimateForce: Antarctica expedition led by Sir Robert Swan, a renowned British environmentalist and explorer who was the first man to walk to both the North and South Poles. 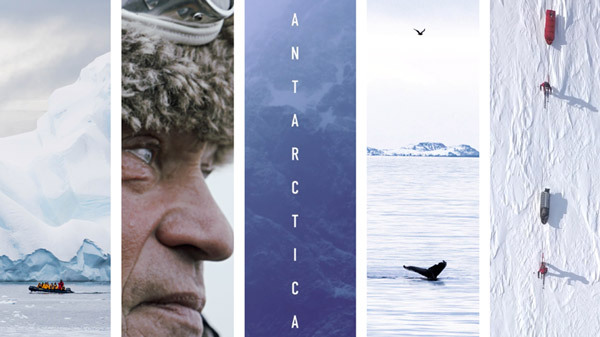 From this expedition, we produced a short documentary, From Asia to Antarctica, which raises awareness about the global climate crisis in the world's fastest-growing region and the urgent need to shift to more sustainable ways of living. Rapid collapse of the Antarctic glaciers and the melting of Arctic ice sheets — brought about by climate change — could flood coastal cities by the end of this century. The collapse of these giant ice masses will spell disaster for humanity. Higher tides will bury every shoreline across the globe, flooding coastal cities heavily concentrated in Asia, and this could create hundreds of millions of climate refugees. Climatic changes are also threatening our ecosystems, triggering tipping points that could send the Earth's natural cycles in a spiral, upsetting the balance and causing changes in crop yields, weather patterns, and accelerating biodiversity loss. This change could happen at a rate too quick for the human race to adapt — and this is why we need to act urgently. Changing Course is an immersive documentary project chronicling climate stories and a platform for exhibitions, competitions, and events that engage a wide spectrum of society to deepen their knowledge of humanity's greatest challenge and how to respond to it. The Arctic is at a critical crossroads. Even if the world were to cut emissions in line with the Paris Agreement on climate change, winter temperatures in the Arctic would rise 3-5°C by 2050 and 5-9°C by 2080, devastating the region and unleashing sea level rises across the globe, finds a new report by UN Environment released in March 2019. Meanwhile, rapidly thawing permafrost could accelerate climate change further and derail efforts to meet the Paris Agreement’s long-term goal of limiting the rise in global temperature to 2°C. Since 1979, Arctic sea ice is estimated to have dropped by 40 per cent. Climate models predict that with the current rate of emissions, Arctic summers will be ice-free by the 2030s. Other challenges facing the Arctic include ocean acidification and plastic pollution, underlining the urgency for the global community to address climate change and help the region adapt. The melting ice is also shaping new geo-political tensions and changing global shipping routes as the Northern Sea Passage makes it possible for ships to navigate previously inaccessible Arctic shipping lanes. These previously untouchable areas may become seasonally or permanently accessible, providing greater access to exploit the Arctic's resources such as fish, oil and gas. In the 2019 edition of Changing Course, we head North on a journey to understand the foremost pressing issues of the region, and its relevance to Asia. An immersive, multimedia exhibition featuring a sequel documentary and climate stories from Asia will be held at a soon-to-be disclosed location at the end of 2019.